Our mission is to provide a boarding experience that is stress free for you and your cat. 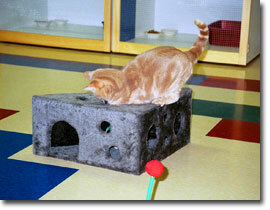 Your cat is given special care and attention by us and you will receive friendly and professional service. We are proud to offer very comfortable accommodations with exceptional attention to cleanliness. 30" whole house fan provides additional forced ventilation.